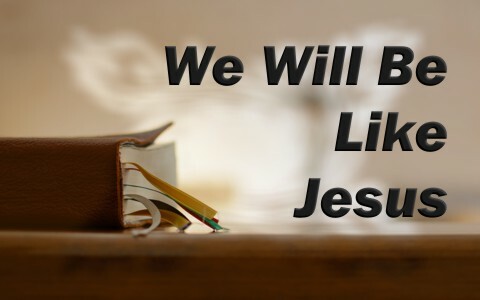 The Apostle John says “we know that when he appears we shall be like him” (1 John 3:2b) but to what extent shall we be like Jesus after death or at His appearance? Before we even think about how we might resemble Jesus in the kingdom or when we finally put off mortality for immortality, we should understand how we are to be like Him today in the body. It does us no good to ask the question, “What will we be like when we see Jesus,” if we are not striving to be like Him today. For one thing, our focus should be on Christ and glorifying Him. Jesus told the disciples to teach all nations the very same things that He had taught the disciples (Matt 28:19-20), which is what the early church did (Acts 2:42), and as we know from the gospels, being like Jesus includes complete trust in God, such as that which Jesus had in the Father. After being asked to see the Father, Jesus told Philip “even after I have been among you such a long time? Anyone who has seen me has seen the Father. How can you say, ‘Show us the Father” (John 14:9)? In other words, if you have seen Him, you have seen the Father, because Jesus always does the will of the Father, and so whatever you see Jesus doing is really what the Father wills Christ to be doing, however another important point is you cannot be Christ-like until you’ve suffered like Christ did. Of course, not to the same extent, but being persecuted by family and by His own people for preaching the gospel of repentance and faith (Mark 1:14-15), so if we want to be like Jesus, we must bring the gospel message of repentance and faith, but remember, they killed our Lord because they hated His message so much, but also out of envy as Pontius Pilate knew that it was for envy that they had brought Jesus to him (Matt 27:18). Focus on Christ, do what He did (Matt 25:38-39), and you will be more like Christ. The disciples saw how much time and effort Jesus exerted in prayer that they asked Him, “Lord, teach us how to pray,” but they really might have been saying. “Lord, we want to pray like You do…we have seen how intimate Your relationship with the Father is and we want that type of relationship.” This is where Jesus gave them an outline which most people call the “Lord’s Prayer,” but it is actually a template or model for them to follow when they pray, so it’s not a prayer to be recited over and over again, but a format that can help us pray with the right priorities (God and His glory, God and His Will, and God and His daily provisions). Remember, Jesus warned us about using useless or vain repetitions before God (Matt 6:7). The Apostle Paul thought we should imitate Christ and not others, even though Paul was a spiritual giant in my eyes, but this man was also a man of prayer, praying for those who were in power, those who were opposed to him, those who had imprisoned him, and every church we read about in the New Testament. Just after Jesus had told the disciples that He was going up to Jerusalem to die and be raised in three days, it’s like they never heard a word He was saying. That’s because they were arguing over who would be seated at Jesus’ right hand or who would be the greatest among them, so Jesus told the disciples that “It shall not be so among you. But whoever would be great among you must be your servant” (Matt 20:26). A person’s greatness isn’t measured by the number of servants they have but by the number of people they’ve served. That is contrary to the way of the world because it’s usually survival of the fittest and whoever is first, is first, and whoever is last, is last, but Jesus turns that on its head (of course) and says “And whosoever will be chief among you, let him be your servant:” (Matt 20:27 KJV). His point is emphasized by telling them that even “the Son of Man came not to be served but to serve, and to give his life as a ransom for many” (Matt 20:28). Being like Jesus is serving and sacrificing like Jesus. Now, what will our bodies look like in the kingdom? Daniel gives us a hint about what the resurrected saints will look like in Daniel 12:1b-2 where he writes, “at that time your people shall be delivered, everyone whose name shall be found written in the book. And many of those who sleep in the dust of the earth shall awake, some to everlasting life, and some to shame and everlasting contempt.” However, “those who are wise shall shine like the brightness of the sky above; and those who turn many to righteousness, like the stars forever and ever” (Dan 12:3). So the saved, who are those found in the book, which could well mean the Book of Life mentioned in the Book of Revelation, they will shine like stars before God “like the brightness of the sky above and those who turn many to righteousness, like the stars forever and ever.” The Apostle John adds, “Beloved, we are God’s children now, and what we will be has not yet appeared; but we know that when he appears we shall be like him, because we shall see him as he is” (1st John 3:2) and for those who have been saved by God, “they cannot die anymore, because they are equal to angels and are sons of God, being sons of the resurrection” (Luke 20:36). We know angels have spirit bodies and may have glory in their appearance, so would God do anything less for His own children after they enter glory? The Apostle Paul once wrote “I consider that the sufferings of this present time are not worth comparing with the glory that is to be revealed to us” (Rom 8:18), and we would think Paul is speaking about the glory that we’ll see when we enter the kingdom, but also, perhaps, we too will receive glorified bodies, but of course, none can compare with the glory that is found in Christ. Focus on the day when we shall see God face to face and He will be with us (Rev 21:3; 22:4). At that point, I don’t care what I look like because I’ll be beholding the very face of God and at that time, seeing Jesus will be all that really matters. Related reading for you: What Would Jesus Do? Tagged as: be like Jesus, Christ-like, What Would Jesus Do? Next post: Did Balaam’s Donkey Really Talk?